Cutting The Cord (Part 4) - One Month Later ... Lower Costs and ZERO Regrets! Here is Part 4 of our adventures as we Cut The Cord! We are of the belief that our TV programming costs could not be maintained into retirement. Almost $125 each month is way too much to pay if we intend to do other things besides watching television in our old age! It is time for a change ... how close to FREE can we get? After selecting our hardware (Roku) and our paid streaming services (CBS All Access, Hulu, and Philo) we tested everything and around the middle of March, 2018, cancelled our DirecTV service. I disconnected the satellite boxes and packed them away. One month after the cut ... This is nice! The most serious problem we encountered after the cut involved the lovely Miss Mindy and our two remote control devices. With cable or satellite, the remote that ran the "box" also handled the television set. One remote, easily mastered, brainless, and painless. 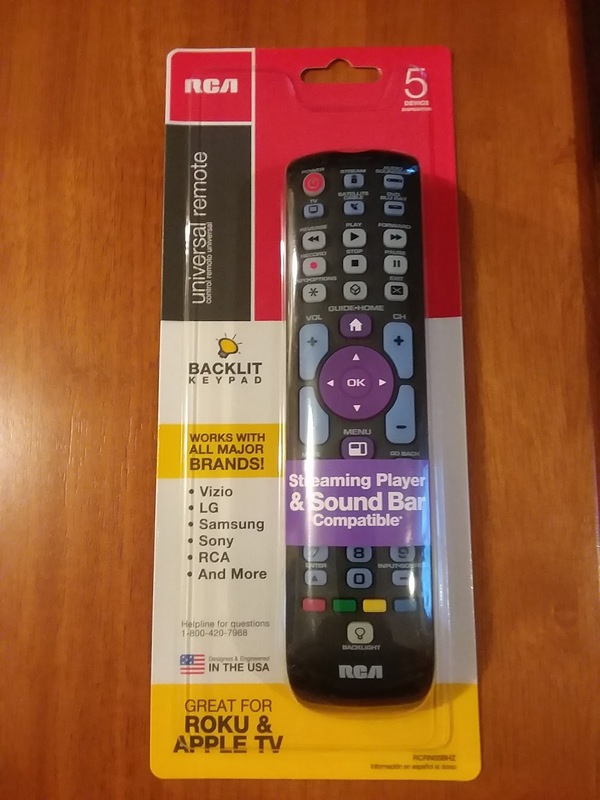 Not so with Roku ... two remotes were needed, one for the TV and one for the Roku. By the second hour of the first day after shutting off DirecTV, she was frustrated with trying to keep track of which remote she needed to perform a certain function. I needed to jump in and save the experiment before she demanded the satellite back! A quick trip to WalMart the next day took care of that pesky remote challenge! 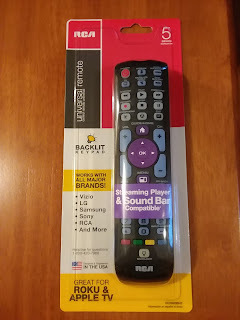 For less than $10, the problem was solved with the universal remote pictured on the left. This control worked right out of the package for the Roku, and only took one code entry to have the Visio TV setup correctly! This control now resides by Mindy's chair, while the original Roku and Visio remotes are at my fingertips. Easy fix! It did take us both a few days to master our new viewing regimen. We had to remember which service we use to watch a particular program. We also had to remember what new programs were available to us on what nights ... a bit confusing to say the least! We Had Become Slaves to the List! One thing that I quickly realized was how much we had become dependent on the DirecTV "List" feature. Pushing a button on the remote brought up a list of all programs that had been recorded, stored on the satellite box, and were available to view. Selecting a program from the list launched it for our enjoyment. It became the method by which we chose our programs ... if it was on the list, it had to be watched! If we fell too many episodes behind (like General Hospital after a two-week vacation in Florida) it had to be binge-watched ... after all, we can't get too far behind!!! OMG - we're behind!!! Of course, my dear bride (with a few OCD tendencies) could not handle being too far behind on viewing recorded TV shows! Stress is not something that should be happening when you are watching television with your wife! While we were enjoying the lack of list-induced stress, we soon realized that we no longer had much guidance (or even knowledge) about what to watch! It became quickly apparent that we had to replace "the list" if we were ever to know how to watch TV ever again! Thank goodness for an old standby: TV Guide. I remember TV Guide from back in the '60s ... a small booklet sold in the supermarket checkout line that had all of our locally available TV listings. Over the years, and with the move to cable and satellite packages, the magazine that we grew up with changed. It is now a bi-weekly publication, focused more on articles about television rather than detailed listings of every show on every channel. The modern-day on-line edition (www.tvguide.com) is actually owned by CBS. I signed up for a free account, specified my favorite shows, and now receive almost daily emails from TV Guide informing me of new episodes and current events pertaining to those favorite shows. I have my email set up to automatically forward those emails to Mindy ... now we know what to watch, and when to watch it! Shortly after the first of the month, I went online to my bank website to make sure that DirecTV had, in fact, cancelled my automatic payment. They did! Over the next two weeks, our three paid services made their scheduled debits for a total of $37.98. I also received a $24.33 refund from DirecTV by way of a pre-paid MasterCard for the partial month cancelled. If I add in the one-time hardware costs of two Roku boxes (living room and bedroom) and a remote control (just under $70 total) I'm still almost $20 ahead in the first month! From hereafter my savings will be about $86 each and every month! Could We Get Closer to Free? Yes ... we could have made it all the way to "Free TV" even without the availability of over-the-air broadcast channels ... but it would have come at a cost to our enjoyment level. If we were totally broke, living on a fixed income, or otherwise unable to pay the $37.98 then yes, we would live with "Free". However, our desire to be only a day or two behind in viewing and be able to skip commercials is well worth the price we are now paying. If we had access to free over-the-air programming, an OTA DVR such as Tablo (about $250 and up) would allow us to record shows from our antenna for later playback over our local WiFi network. "Cable" channels would still have to come from a streaming service such as Philo. Nothing, really ... except Red Sox Baseball (and other sports programming.) For some, this would be a deal-breaker. NESN (which carries all Red Sox and Bruins games, except nationally-televised games) is available (along with other sports-themed networks like ESPN or FS1) with a subscription to either fuboTV or You Tube TV, for about $40 per month. Play Station Vue also carries NESN for about $45 per month. The nice thing about streaming services is the no-contract provision, so if the Sox are in a tight pennant race in August, I just might sign up for a month or two and cancel afterward! In the meantime, I purchased a season-long subscription ($19.95) to Gameday Audio, MLB's streaming audio service. I can listen to the radio broadcast of every MLB game (without blackout restrictions) and select from either team's broadcast along with the Spanish language broadcasts if desired. Looking back to the days of my youth, many a ballgame was spent with my Grandfather listening to the Red Sox on radio ... and we enjoyed each and every game that we listened to together! MLB-TV also has a free app on Roku, that features one "free" game every day along with video highlights from every other game - all available without subscription. A "condensed" game is also replayed about 90 minutes after the game is over via the MLB team websites. So, I can listen to games on Gameday, and see every exciting play afterward on my computer. What Pleasures Have We Discovered? Without the pressures of "The List" we are enjoying a more relaxed approach to our TV viewing. On some of the free Roku content (Baby Boomer TV and the Roku Channel) we are watching some of the old shows of our youth. CBS All Access has some shows from the more recent past that Mindy is enjoying, since she missed the first several seasons of some of them. Now that I have DIY, Texas Flip and Move and Barnwood Builders get regular views from me as well. More importantly, we're not tied to a list, but rather are enjoying the browse through the programming forest without haste or anxiety. TV seems more fun ... and I still don't have to fuss with an antenna! Our content comes via the Internet; therefore, wherever we have access to the "web" we have access to our programming. Our Android phones, Mindy's Kindle, and my iPad have now become truly portable TV sets. When we visit my mother in Florida, we plan on bringing a Roku with us so we can keep up with our favorite shows. A two-hour airport layover may become more enjoyable without the need for overpriced adult beverages at the terminal lounge! Cutting the cord also made me take a look at other entertainment costs that could be saved. For years I have had a subscription to XM radio in my car. This dates back to when I was traveling quite a bit and playing music several nights a week. My XM listening is down to just a couple of talk shows and the occasional "classic old-time radio" show or two. A 99-cent app for my smart phone lets me download free public-domain radio shows from the '30s, '40s, and '50s, while free apps let me download favorite talk show content on-demand. As of today I have cancelled my $220 per year XM radio habit! $86 per month saved on television, and $19 saved on XM radio, for a total of $105 saved every month. If I invest that savings each month in good quality growth-stock mutual funds with 12% annual track record, I will have $45,370 in my investment account after 15 years. Ok, maybe a bit too risky for some of you, but that same calculation at 8% (the average rate of return for the stock market) still produces a balance of $38,940 after 15 years! I guess I do have one regret after all ... we should have done this years ago! 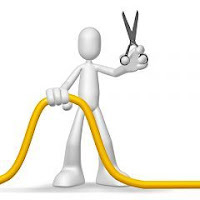 Cutting The Cord (Part 3) - An Unbelievably Bad Customer Service Experience! Here is Part 3 of our adventures as we Cut The Cord! Plan your work ... and work your plan! Taking the list of programs and channels, we looked at various service packages to see what we could find that would suit our watching needs at the lowest possible cost. We settled on a combination of three paid services, along with several additional free streams. All of the broadcast networks (ABC, CBS, NBC, Fox) offer some form of free on-demand streaming. The drawback, however, is that the shows are not available on the network stream until several days after the air date. If you are one who absolutely must know who gets voted off the island before you go to bed, free streams are not for you! But, if you don't mind waiting up to a week to view the latest episodes of your favorite shows, free is not a bad price! Of course, if you live in an area with good over-the-air broadcast signals you can always watch live broadcast TV . . . just like we all did back in 1965! One common feature of streaming services is a free trial period. When you sign up, you will need to provide a debit or credit card number for billing. Most services offer a seven-day free trial (Hulu offers the first month free) and do not bill your card until after the trial is up. These are all no-contract services; as long as you cancel prior to the next billing date there is no additional payment required. If you (like us) cannot receive broadcast TV signals, some form of live stream will be needed if you wish to stay up-to-the-minute with the latest Bachelor or Bachelorette. Live stream packages generally cost around $40 per month, and offer about 50 channels. If you want to record shows to watch later, some of the packages offer DVR service as well. Since we were rarely watching live TV, we did not feel we would be missing anything if we no longer had it. Hulu is one of the early pioneers of television streaming, and offers a well-rounded package of programming from most of the major networks, both broadcast and cable/satellite. New episodes of ABC, NBC, and Fox shows are available 24-48 hours after broadcast. A basic subscription costs $7.99 per month, with an optional commercial-free version for $11.99. The service is easy to use and navigate, and allows you to build a list of regularly-watched shows for easy selection. It keeps track of which episodes you have already viewed, and will even remember where you were if you stop watching in the middle of a program. One major drawback, however, is the lack of CBS programming. Along with that, many of our regularly watched cable network shows (like Alaska, The Last Frontier) are as many as two SEASONS behind! Instead of selling content to services like Hulu, CBS has taken the bold step of selling content directly to the viewer. I like that idea! For $5.99 a month, CBS All Access gives you next-day access to all new shows, along with on-demand access to a vast library of CBS content. If that wasn't enough, they also give live access to the "local" CBS affiliate, which in our case is WGME/Portland, ME. So, in case of major news or weather events we are still able to watch at least one real, honest-to-goodness live television channel! Like Hulu, CBS also offers a commercial-free option for $9.99. Philo is an interesting player in the streaming-content arena. They offer live-streaming along with the ability to save programs (almost like a DVR, only different!) for later viewing. Their service, at $16 per month, is substantially lower than other live-stream services. The reason for the low cost is because Philo does not carry the four broadcast networks or sports programming. (Those are the channels that cost the most!) We rely on it to provide content from A&E, Food Network, Discovery Channel, History, HGTV, DIY, and several others. With those three services we replaced all of our regularly-watched content, with the exception of Red Sox Baseball on NESN, for a cost of only $37.98 per month, down from our monthly satellite cost of about $125/mo for a savings just shy of 60%! After a few days of watching both streaming and satellite (and proving to Mindy that she wasn't going to miss any of her favorite shows) we were ready to make the cut! The. Worst. Customer. Service. Experience. Ever. I am a fan of The Dave Ramsey Show, a nationally-syndicated radio talk show that focuses on eliminating debt and building wealth for retirement. Dave tells his callers that they are on the right track when they follow his advice and their broke friends think they're crazy! Cutting the cord can bring about a similar reaction from friends and family ... but I never expected the treatment I received when I called my satellite provider to give them the news! When I started writing this story at the beginning of our journey, I purposely did not identify my now former provider by name. I was not mad at them in any way, but was only looking to see if I could save money on programming costs. I did not identify them out of respect for the service they provided to me for the past five years, along with my intent that if I ever returned to satellite content they would be at the top of my list. Sad that a simple phone call to DirecTV would change that! "So, Lloyd, just so I get this right, you want to discontinue your DirectTV service ... is that correct?" "Yes, and please call me Brad. All my friends call me Brad," I said. "Ok, Lloyd, can you tell me why you want to discontinue today?" he said, obviously not listening well. "If I may, I'd like to see what DirecTV can do to keep you as a customer." "You can start by calling me Brad, I replied. "It is simply a matter of cost. I am at a point where I need to spend less money each month, and I am replacing the satellite content with streaming video." "Well, Lloyd, if we can save you money on your monthly bill would you be interested in staying with us? I'm sure I can do something for you." "No, I'm really not interested. I just want to disconnect my service." Bubba continued his sales pitch, insisting that if I could just give him a minute or two he wanted to check to see what they could do to keep me. Bubba started asking about the weather in New Hampshire, and told me he was in Georgia. After a minute of polite chit-chat, he said "Lloyd, I think we can save you a lot of money. How does $69.95 a month sound? Can I sign you up for that? Of course, Lloyd, that would be with a two-year service agreement so we can guarantee that low price for the next two years." "Um, no ... please just cancel my service." He kept on pushing and trying to close the sale. In frustration, I made the mistake of telling him that I would be paying around $37 a month for streaming services. He then came back with the amazing low price of only $27 per month for satellite! His tone of voice and attitude changed as I persisted in telling him "NO". Gone was the polite attitude. He finally stopped calling me Lloyd. He started yelling at me and demanded to know why I wouldn't keep DirecTV for only $27 a month. I had finally reached my limit, and asked to speak with his supervisor. He kept right on pushing until I finally screamed, "SUPERVISOR! NOW!" "Mr. Bradford, you want to speak with my supervisor? Is that correct?" he asked. "I don't think that is neccessary." "SUPERVISOR!" I exclaimed. "RIGHT NOW!" The phone went silent for a few seconds. I thought Bubba may have hung up on me. Finally I heard a much quieter voice asking "If I can be allowed to disconnect your service, will you allow me to do that without involving my supervisor? Please?" It really shouldn't be that hard! Join us next time for Part 4 as we discover some pleasant side-effects from cord cutting ... along with the start of baseball season and no Red Sox on TV!